Braised Pork Belly is a perfect dish to let cook in a slow cooker. 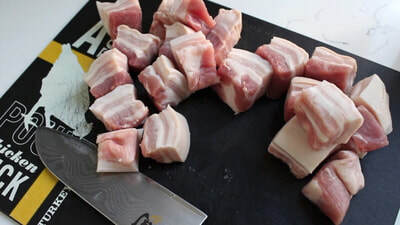 The normally thick skin of the pork belly, and the tough meat both just melt into tenderness when slow cooked for long periods of time. 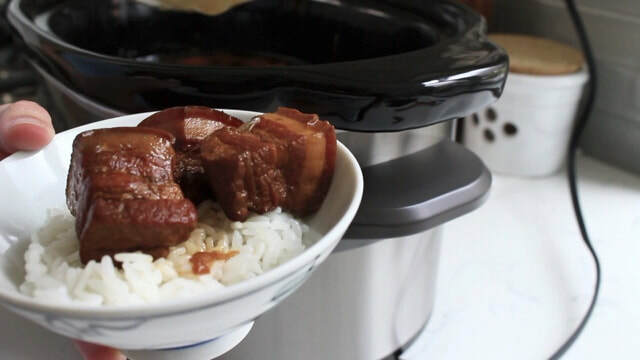 This recipe is based on my stove-top 滷肉飯 (Lǔ ròu fàn) or Braised Pork over rice recipe. I've added dark soy sauce in this recipe to give the pork and eggs a deep caramel color, all while making this more savory. I recommend cooking 6 hours on high, or you can set your slow cooker on low for 10-12 hours. TIP: After cooking, let your braising liquid cool and then store for later use. To use the braising liquid again, add more water + optional extra ingredients to your liking. Feel free to experiment! Cook Time = 6 hours. 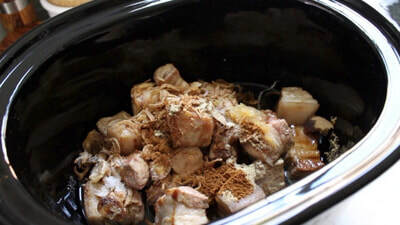 Cut the pork belly into large pieces, then brown for a few minutes before putting into your slow cooker. 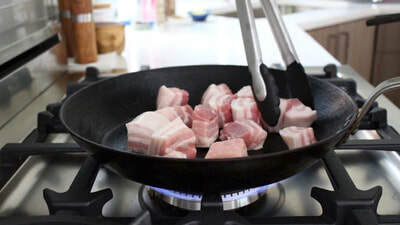 Add all the seasonings and water (just enough to cover the pork ~ approximately 4 cups of water), then cook on high for 6 hours. Add optional medium boiled eggs or other ingredients like bamboo shoots (if so desired). Serve hot over rice. Spoon a bit of the braising liquid over the pork, eggs, and rice for extra flavor.